Siliguri: Trinamul leaders based here have drawn up a plan to intensify political activities in the city and in the surrounding areas of Siliguri subdivision to foil any attempt by the BJP to regain support, particularly of the supporters of the Gorkha Janmukti Morcha in the Terai. Though panchayat elections will not be due in the sub-division this year unlike other parts of the state - rural polls here will be due in 2020 - Trinamul is not ready to take any risk and has decided to increase its activities. "This is because the BJP, after buoyed by the win in the Assembly polls of Tripura, might try to build bases in the Terai. 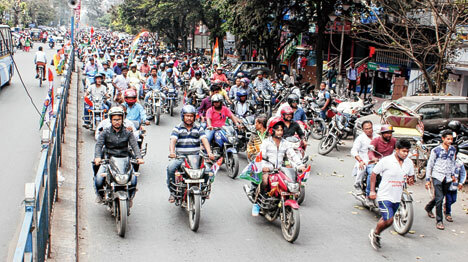 We should not forget that in the surrounding areas of Siliguri, there is a steady presence of Morcha supporters. The BJP has been shunned by the hill residents as was evident during the visit of the party's delegation to the Darjeeling hills in October last year but the party might try to penetrate into the foothills again," said a senior Trinamul leader. Party insiders pointed out that the BJP's activities had gained momentum in Darjeeling district after party president Amit Shah had visited a hamlet in Naxalbari and had lunch at the house of a tribal family on April 25 last year. However, the party leaders fell silent as Bimal Gurung launched the agitation for a separate state in June last year. Since then, the BJP has faced setbacks due to a number of reasons, including the absence of Darjeeling MP S.S. Ahluwalia from his constituency and gradual shift of support from Bimal Gurung to Binay Tamang, with the latter emerging as the new key leader in the hills. "Bimal Gurung is still with the BJP and Binay Tamang has not shown any interest to build up his party's base in the foothills. Unlike Gurung, he has kept activities of the Morcha confined to the hills. That is why the Morcha has faced mass defection in the Dooars and most leaders and supporters have joined Trinamul. But in the Terai, there is still a good number of confused Morcha supporters," said an observer. It is this people that the BJP might set its eyes on and Trinamul is not ready to take any chances. On Monday, the Darjeeling district youth Trinamul organised a "Sadbhavna Yatra" (amity march) that started at Khoribari and ended at Baghajatin Park of the city. Several party leaders and workers, including some former players, joined the event. Trinamul leaders based here have drawn up a plan to intensify political activities in the city and in the surrounding areas of Siliguri subdivision to foil any attempt by the BJP to regain support, particularly of the supporters of the Gorkha Janmukti Morcha in the Terai.